A hidden sniper terrorizes six friends stranded on a deserted road. Todd Acosta, his girlfriend Sarah Fletcher, and their new carpooling friends Jodi, Keren, Jeff, and Eric become stranded on a remote country road when their SUV suffers a tire blowout. While changing the tire, Jeff is suddenly killed by silent sniper fire. The unseen sniper shoots Sarah next, prompting Eric to take cover behind a tree stump while Jodi, Keren, and Todd hide behind the vehicle. The sniper shoots a cellphone off a selfie stick when the trio behind the vehicle tries getting a signal to call 911. Keren uses her hoodie to create a distraction while Todd, who is additionally suffering from a slug lodged in his arm, unsuccessfully attempts to put the SUV in neutral so it can be moved for rolling cover. Eric uses a video shot from his cellphone camera to determine the sniper’s position. Todd retrieves a toolbox and duct tapes its medal lid to his arm for protection. Although he takes another shot in the process, Todd manages to get the SUV rolling on his second attempt. However, the SUV rolls in the opposite direction until the sniper shoots out another tire and disables it. Eric tries running toward nearby trees in the commotion. The sniper shoots Eric in his ankle as well as his leg. Eric hits the ground and eventually passes out. Keren uses a lighter to heat a hammerhead for cauterizing Todd’s arm wound. After retrieving a water bottle from the backseat and taking swigs themselves, the trio tosses the bottle to Eric. The sniper shoots Eric through his hand when he tries taking a sip. During a quiet moment, Todd tells Jodi and Keren that his girlfriend Sarah was pregnant, but lost their baby. Lost in reflection and losing hope, Todd goes to drape a shirt over Sarah’s face. Surprisingly, the sniper does not fire. A wolf comes to sniff around Eric, although it does not attack. Eric eventually dies from blood loss. Todd sees a vehicle approaching from the distance. The sniper resumes shooting and kills Todd to prevent him from flagging down the other car. The sniper shoots the male passenger in the vehicle. At the wheel, the man’s wife loses control and flips their car, ejecting their daughter in the backseat through a window. The sniper shoots the mother when she tries moving from the wreckage toward her daughter’s position. The father drags his wife behind the car. Jodi and Keren scream at the man to call 911, which he does. The sniper shoots the flipped vehicle’s gas tank. The resulting explosion kills the man and the woman. The sniper then executes their daughter. After night falls, Keren and Jodi set fire to their SUV to create a smokescreen. Before the women can make a break for it however, a sheriff arrives at the scene with a deputy and two police marksmen. The sniper takes out one of the sharpshooters as well as the sheriff. The sheriff’s truck loses control. Keren makes a run for it in the smoke. The sniper shoots Keren through her head. Jodi regroups at the sheriff’s truck with the deputy and remaining marksman. The sniper shoots the second sharpshooter as well as the deputy. Jodi gets in the truck and speeds toward the sniper’s position. Jodi hits the tree where the sniper is perched, knocking him to the ground after he cuts himself free from tangled rope. Jodi recovers the sniper’s dropped rifle and uses it to shoot the sniper several times. When the gun jams, Jodi uses the stock end of the rifle to repeatedly bash the sniper in his face. However, Jodi’s final strike causes the gun to fire a bullet that tears through her throat. Although she kills the sniper, Jodi chokes to death on her own blood. Six newly acquainted friends stranded on a seldom-traveled country road. An unseen sniper perched in a distant tree. 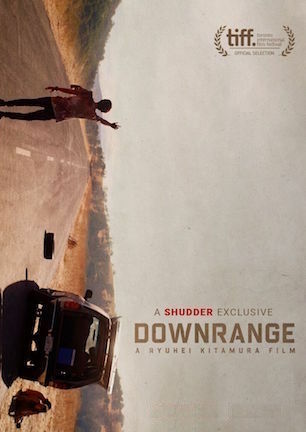 That’s all there is to “Downrange.” I’d add, “no muss, no fuss,” except Ryuhei Kitamura’s film has some of both. “Downrange,” which you can tell from the two-sentence summary has more setup than actual story, doesn’t waste time putting its premise in motion. The sextet’s SUV suffers a tire blowout less than 60 seconds into the movie, leaving everyone lost in a land of spotty cellphone reception with an even spottier likelihood of someone else driving by. “Downrange” does drag its feet getting to the gunfire though, as the next 15 minutes fill up on inconsequential exposition. With a plot consisting of basically one beat, Kitamura knows he has two acts to kill. He starts doing so by having the three men and three women pass the time with idle banter while one of them changes the tire. One pair is a boyfriend/girlfriend duo, yet the others share only vague connections that aren’t entirely specified. It appears as though everyone recently met through some carpooling arrangement since some of them are heading to different places. I can’t imagine what disparate agendas could possibly link relative strangers to needing transportation on the same deserted road, but none of this chitchat matters anyway, although none of it is interesting either. The sixsome’s blather mostly highlights how staged the film feels. Performances are stiffer than pure gin martinis. Actors move magnetically toward their marks, recite lines with rehearsed rhythms, and generally come across like people practicing a play. Meanwhile, thinness to the script’s substance unavoidably tightens another tripwire for the tempo. The film’s first hour consists entirely of failed attempts to subvert the sniper’s strategy, e.g. using a selfie stick to extend a cellphone for dialing 911, creating a decoy using discarded clothing, or attempting to disengage the brakes to turn the SUV into rolling cover. Any viewer with a watch immediately realizes none of these survival seeds will bear any fruit when the runtime has yet to hit its halfway point. Knowing this group sits far from the finish line means they aren’t about to enable a rescue or turn the tables on their attacker anytime soon. In turn, there isn’t much tension inherent in watching them partake in plans assured by the clock to deliver less than desirable results. “Downrange” piles on overdramatized efforts as it rolls forward. After sniper fire pierces one person’s eye socket, the victim staggers around for what seems like a virtual eternity, with slow-motion exaggerating the overlong death stumble even further. When a close-up cuts to an out-of-reach water bottle sweating juicily, a condensation drop audibly plunks like the shot was ripped right out of a Pepsi commercial. Gore also has its gruesomeness undercut by bright red giallo blood that reads closer to acrylic house paint. Curiously, applying a thick coat of unrealism may have been the director’s intention all along. “Downrange” takes a demented detour into a bonkers final third by going for broke with midnight movie moxie. From one absurdly improbable development to the next, the film finally finds its footing in an over-the-top style that takes entertainment value from zero to sixty in a matter of moments. Without this gleefully exploitive grindhouse vibe driving the climax, the heaping helping of nihilistic horror would otherwise be too serious of a pill to swallow. Ryuhei Kitamura may have sensed the dullness draping over the movie and opted for pure outrageousness to pick up the pace. Or Kitamura ingeniously orchestrated the shift from the start, conditioning viewers with body blows of banality before unleashing an onslaught of insanity. All of the silly slaughter that elicited guffaws for being too phony suddenly seems purposeful in setting up the audience for the explosiveness that follows. That rip of ridiculousness didn’t work before, but it definitely does now. I only wish “Downrange’s” first 60 minutes were as enjoyably unhinged as its last 30. Out of five possible stars, the initial hour earns just one for its long lull of predictability, poor acting, and pointless plotting. Once the lid blows off however, exponential improvements in the movie’s cynically sadistic attitude amp energy levels considerably. The climax can have three more stars, evening out the film to an overall ranking slightly above average. “Downrange’s” weird DNA leaves it incapable of pouring tea into everyone’s cup. But anyone with a dark sense of humor who can stick it out through the end should be rewarded with sinisterly satisfying snickers. April 25, 2018 by Ian Sedensky.